• For quantitative determination of Mg2+ and evaluation of drug effects on magnesium metabolism. • Magnesium (Mg) is one of the most abundant and essential minerals in mammals.Magnesium is involved in more than 300 biochemical reactions in the body and plays important roles in muscle and nerve functions, heart rhythm, immune system and bone formation. Magnesium deficiency may lead to nausea, fatigue, muscle contractions, hypocalcemia and hypokalemia. Simple, direct and automation-ready procedures for measuring magnesium concentration in biological samples are becoming popular in Research and Drug Discovery. BioAssay Systems magnesium assay kit is designed to measure magnesium directly in biological samples without any pretreatment. A calmagite dye in the kit forms a colored complex specifically with magnesium. The intensity of the color, measured at 500 nm, is directly proportional to the magnesium concentration in the sample. The optimized formulation minimizes interference by potential substances. 1. What are typical optical density readings of deionized water and the magnesium standard in this assay? The OD reading will vary with the experimental conditions and the OD reader used. In our laboratory, the OD(500 nm) for distilled water is typically around 0.300, and after the addition of EDTA basically unchanged, for instance 0.296. 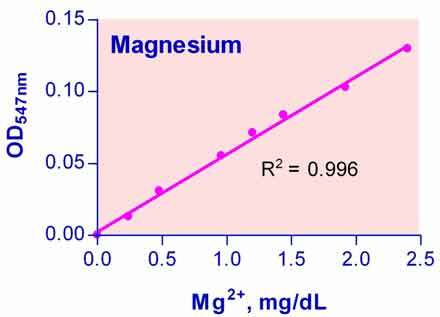 For the magnesium standard, the values are typically around 0.450 and 0.295, respectively. 2. What is the variability across replicated well samples? The intra-assay variability is typically below 5%. 3. Do you recommend me to dilute my samples for the Magnesium Assay Kit? Whether you need to dilute your sample depends on the nature of the sample and the expected concentration of Mg. Normal Mg levels in blood are 1.7-2.3 mg/dL and fall within the linear detection range of 0.1 to 3 mg/dL - dilution is thus not necessary. On the other hand for urine samples, normal values are typically higher, around 7.2 -10.8 mg/dL, and a dilution of the sample is necessary.